CLICK HERE TO REGISTER FOR THE SPRING 2019 SESSION NOW! Cyclones In-house Developmental League Registration is open SIGN UP asap to ensure your spot!! The Jr. Cyclones league is for those who have passed the Jr. Cyclones Pre-Hockey class, or Hockey 4 and Stick and Puck from the Skate School hockey classes. 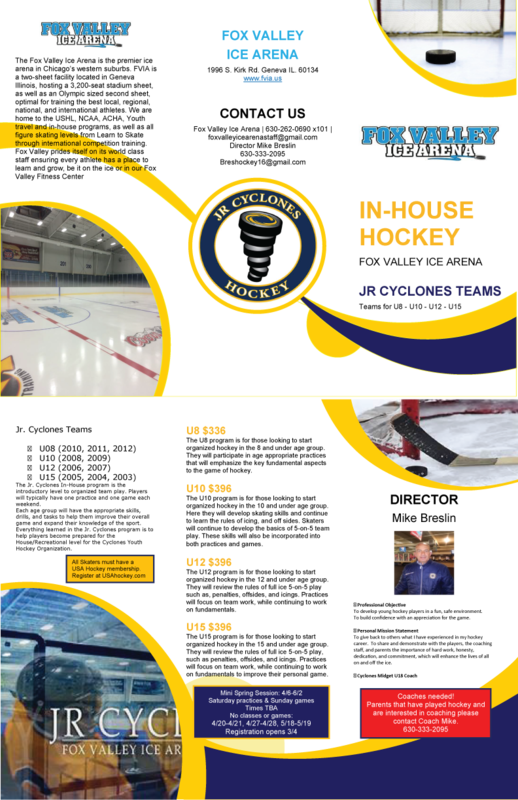 For any inquiries regarding Junior hockey programming, instruction, classes, or clinics, 3v3 Pond Hockey or Jr Cyclones league please contact Coach Mike Breslin at breshockey16@gmail.com, or by calling 630-333-2095 for more information.